It’s been a busy week on multiple levels. Accordingly, there’s been a small gap in coverage. Of course, the release schedule towards this time of year clicks into fifth gear and unleashes a cavalcade of new material upon an unsuspecting public. All three formats had multiple entries worth multiple listens and looks. Chief among them, as usual, was the individual song slate. Since covering all of the great songs to have come out over the past few days would be pointless from a pragmatic standpoint, they’ll be listed below- and it has been a strong few days for this particular category. A large handful of the songs contained in the list below the song in the headline would have been featured on any given day over the past handful of months. That, of course, also bolsters the strength of the song that can lay claim as this post’s focal point: Dilly Dally’s fierce “Purple Rage”. 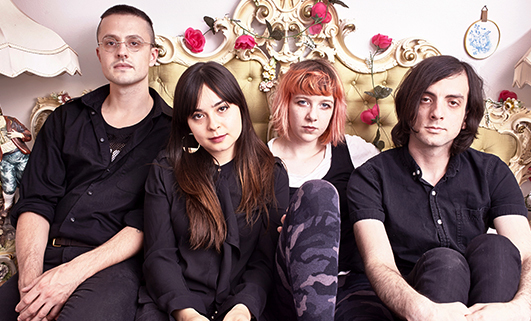 Over the past year, Dilly Dally have established themselves as a serious force, becoming one of this site’s most celebrated acts in the process. After coming dangerously close to topping the year-end list for 7″ releases, the band immediately set about crafting a debut full-length to capitalize on a shockingly strong statement and lay waste to the notion that whatever magic they tapped into for those first two releases couldn’t be sustained. Just about everything the band’s released this year has earned serious praise here and “Purple Rage” arguably tops them all. From the coy title- a winking nod towards the Prince classic- to the total embrace of anger (an aspect that informs and drives a lot of the band’s music), “Purple Rage” has all the makings of a knockout blow. In its execution, it exceeds those elements and becomes a jaw-dropping showstopper that showcases the band at their most relentlessly bruising. Even its mechanics are notable; anger’s an emotion that rises and guitarist/vocalist Katie Monks’ vocals mirror that rise at the song’s outset, growing (subtly) more impassioned as the song progresses. Once again, the lead guitar tones seem to cut through the mix with a vengeance, all at once occupying a space that feels vibrant, eerie, and menacing. The rhythm section’s practically required to be frighteningly propulsive considering the song’s subject matter and it elevates the song to a higher level by both adhering to and subverting those expectations throughout the song’s three minute run-time. Every element acts in perfect complement to the others, conjuring up a foreboding, and maybe even threatening, atmosphere. It’s the kind of song that pierces immediately and then gleefully rips open the wound it created. Manic, wild-eyed, resilient, and unforgiving, “Purple Rage” is another meticulously crafted and deeply felt examination of base human instinct, allowing it to reside comfortable in an already shockingly brilliant discography. Should the rest of Sore live up to its previews, the band may have a viable Album of the Year contender on their bloodied up hands. Listen to “Purple Rage” below and pre-order Sore ahead of its release date here. Below the player, explore a long list of some of the week’s most notable songs.